Joined by victims of torture at the hands of the Ethiopian government, Rep. Chris Smith (NJ-04) and Rep. Mike Coffman (CO-06), came together this afternoon to bring to light the actions of the oppressive government of President Mulatu Teshome. “Feyisa Lilesa helped bring this issue to the international stage last year, but we must not let these violations fade from the public eye,” Smith continued, referencing the Ethiopian Olympic silver medalist who showed a symbol of solidarity with the Oromo people in the 2016 Olympics. The press conference coincided with the introduction of the bipartisan H. Res. 128, which offers an outline to bring Ethiopia back onto the path towards Democracy. This resolution is designed to promote democracy and good governance in Ethiopia and, among other key provisions, condemns the actions of the Government of Ethiopia and calls on the Secretary of State to improve the oversight and accountability of U.S. assistance in Ethiopia. “This week, my colleagues and I introduced a bipartisan House Resolution calling on the Government of Ethiopia to take clear and decisive steps to respect the human rights for all Ethiopians. The United States has closely observed a pattern of abuse by the Ethiopian government’s security forces while denying too many of its citizens the basic freedoms guaranteed under the Ethiopian constitution,” said Coffman. 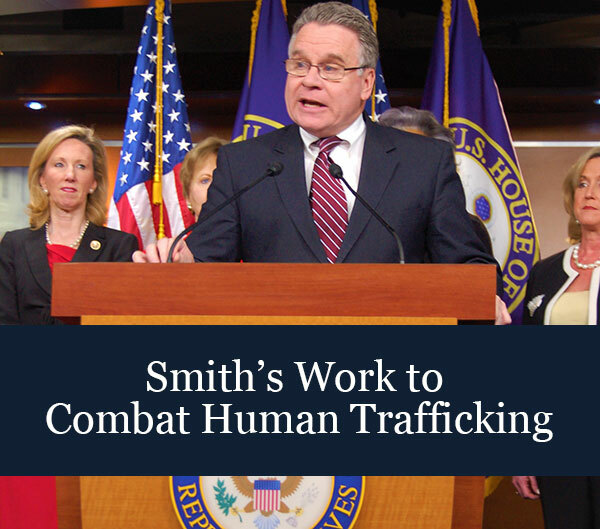 Alongside Smith and Coffman was Seenaa Jimjimo, Tewondrose Tirfe and Guya Abaguya Deki, who have all seen the abuses of the Ethiopian Government first-hand. "Ethiopia's ruling regime wanted to control me and demanded that I join the ruling party," said Deki, describing his brutal treatment at the hands of the Ethiopian government. "When I refused, they dumped me in a jungle area with my wheelchair, believing hyenas would attack and kill me. But I survived. I am very grateful to Congressman Chris Smith for introducing this resolution on human rights in Ethiopia. I hope other Members of Congress will support it to stop torture and other horrible human rights abuses committed by the government of Ethiopia." "The ruling party of Ethiopia, TPLF, has been and continues to commit ethnic cleansing on the Amhara ethnic people in Wolkite and other regions of Ethiopia," said Tirfe. "This resolution puts the Ethiopian government on notice that their continued human rights violations of innocent civilians will not be tolerated." “We understand Ethiopian government is an ally to fight the war on terror, but the U.S. and West have an obligation to speak up when those values contradict the very essence that made America what it is in the first place,” said Jimjimo.